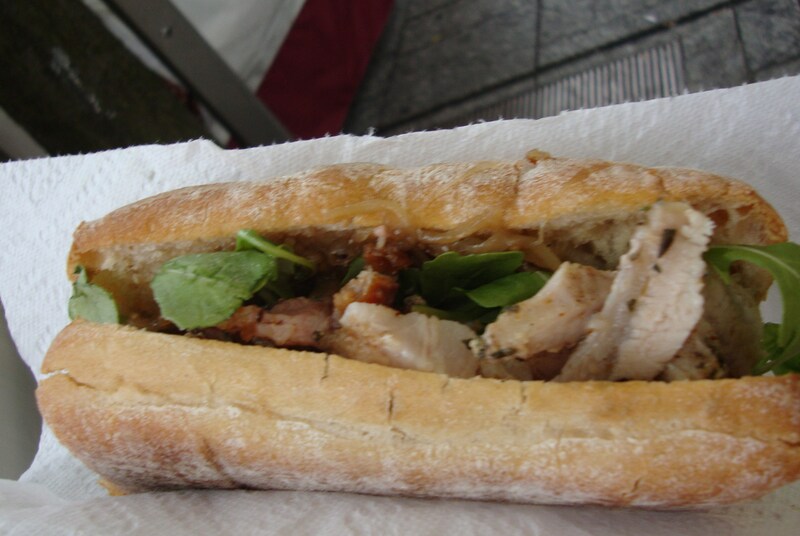 Porco Streetfood in the Old Market Square – Excellent Porchetta! I was on slab square this Saturday, picking my way through the throngs, hunting for the Monthly Farmer’s Market and a much anticipated foodie date with Porco Street Food. Was it only just a month ago that I had found out all about them via Twitter, and found out that they were selling one of my all time favourites the glorious Porchetta? The last time I got my hands on some of this was at Panozzo’s Italian Market in Chicago back in November last year. At Panozzo’s they took a dry cured pork belly wrapped around a fresh-herb marinated pork shoulder and slow roasted it overnight. The Pork Belly was cured with toasted fennel seed, toasted black pepper seed, coriander, bay leaves, kosher salt for 2 days and the pork shoulder marinated in olive oil, garlic, sage, rosemary, and orange zest also for 2 days. It is not a slow process to get such a delicious meat. 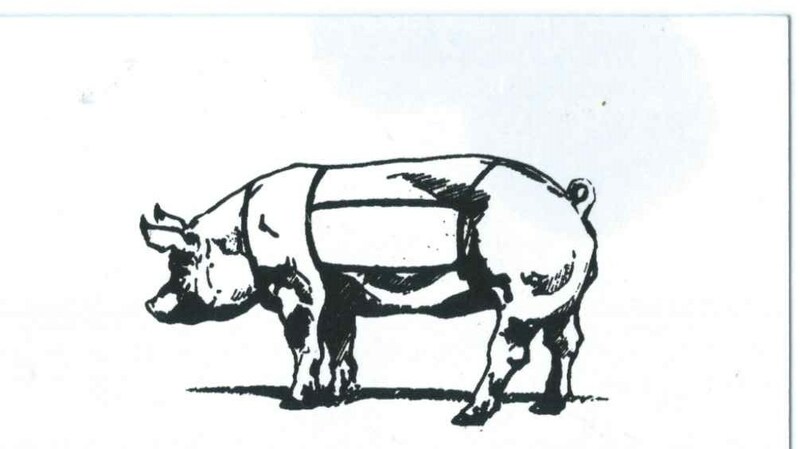 I was really intrigued, excited and very hungry to discover how Porco made their version! 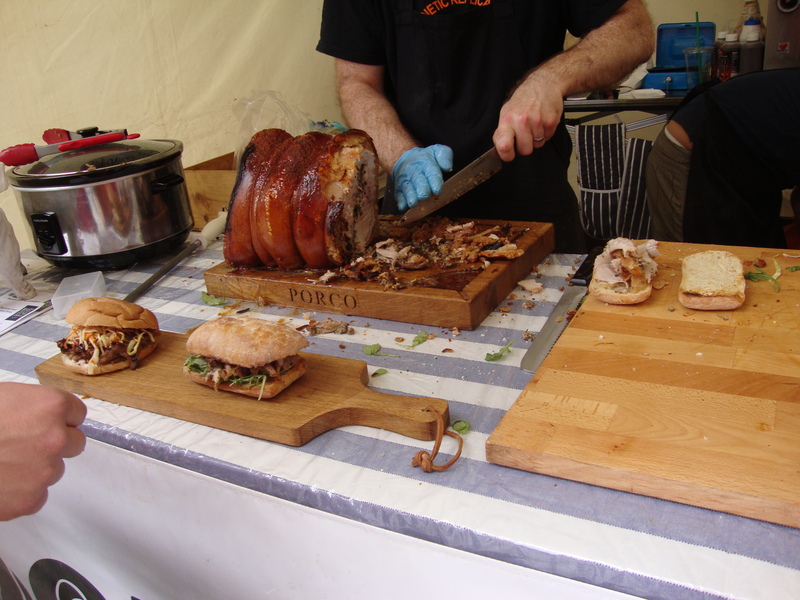 It started really well when I found the Porco stand and I was able to cast my eyes on Jez carving slices of meat from a beautiful looking Porchetta roll. The belly pork on the outside was glistening and looked super crispy. 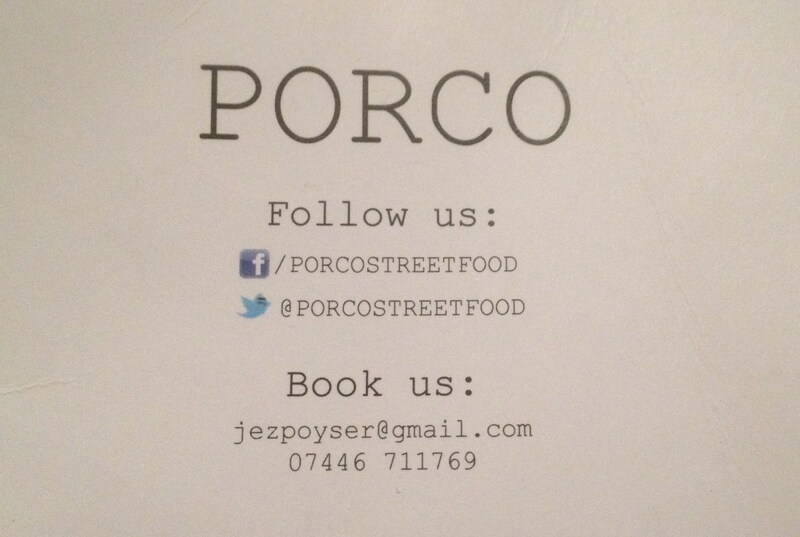 The meat was being carved on a customized chopping board with the name Porco carved into the front. On the Friday my Mum had headed over in an advanced Porchetta sandwich hunting mission and found out that the board had been a Father’s Day gift. In the picture above you can see sample of the two sandwiches on offer and you can also see my sandwich in mid preparation alongside. 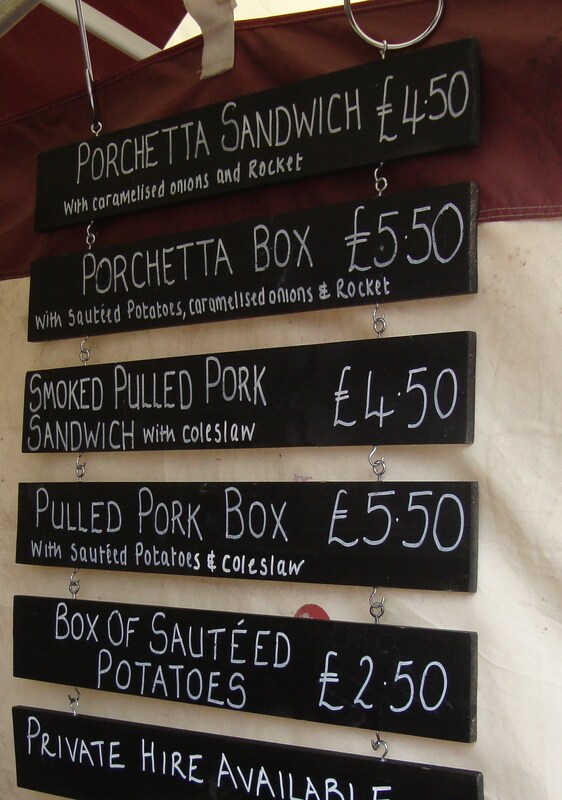 I had the Porchetta Sandwich with Rocket and Caramalised onions for £4.50 and it was pretty amazing. The meat and filling were sandwiched between two halves of a ciabatta roll (lightly toasted to order) which was just about the perfect holder for the job. The pork was moist and juicy, I was getting citrus bursts and herb hits from each bite, it was almost as if I had a lemony sage and thyme stuffing from a sunday roast smeared lightly over the meat. Another great part of the sandwich is the crispy crackling which was chopped up carefully by Jez on that Porco chopping board into small crunchy bite sized pieces. That was a good move as then they sat nicely in the sandwich and added a crunch that was not going to be breaking your teeth. The peppery rocket was all that you needed salad wise and the caramalised onions were just about perfect a little bit of a sweetness to the whole affair. I really have to return back to Porco, not just to say hello properly and thank Jez for reuniting me with my beloved Porchetta, but also to try the other menu option of the Smoked Pulled Pork, another personal favourite delicacy when cooked perfectly. The next chance (unless you book them for a private hire event) is going to be as I understand on the 16th or 17th August when there will also be the chance to try his 12 hour hickory smoked pulled pork shoulder. Jez also tells me that he is developing his own BBQ sauce and pickles, it just gets better and better, this is music to the ears, or is it whispers to the taste buds?